2 Bedroom Terraced House For Sale in Guildford for Guide Price £400,000. A delightful two bedroom home forming part of a historic, Grade II listed courtyard of 8 houses which were converted from the original stables and coach houses of Wonersh House. Dating back originally to the mid 1700's, the property has recently been redecorated and has great character with exposed wood flooring, an open fireplace and a modern cream fronted fitted kitchen with a ceramic hob, Bosch oven and an integrated fridge/freezer. It should be noted that there is no rear garden and to the front of the house there is a small area of lawn, which doubles up as the parking area. 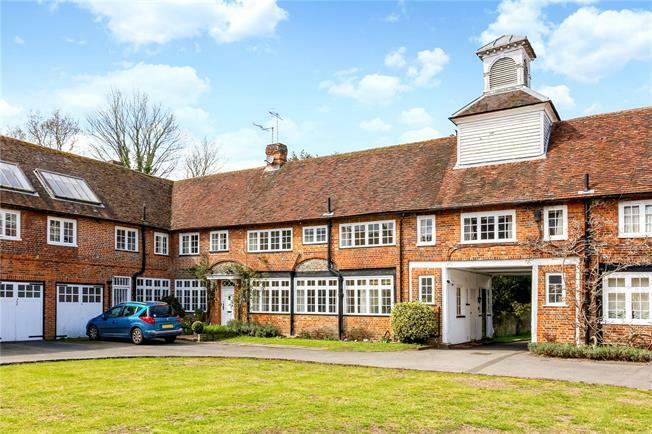 Wonersh Court is conveniently situated in the heart of Wonersh village and yet set well back from the village road, close to all the village amenities including the shop, Doctor’s surgery and pharmacy and The Grantley Arms pub. The village street is one of the most picturesque in the area with period cottages lining both sides of the road. Wonersh is located just over 3 miles to the South of Guildford, at the gateway to the Surrey Hills AONB. The village is in the Greenbelt and is surrounded by glorious countryside and pretty villages such as Bramley, Shamley Green, Shalford and Blackheath. The historic High Street is within easy reach by car or bus and offers a wide selection of excellent shops, restaurants and bars. Mainline stations in Guildford and Shalford provide a fast and regular commuter service to London Waterloo in as little as 38 minutes. Waverley Borough Council Tel: 01483 523333. Tax band F.